Your mother forgot one point when she said ‘eat your veggies because they’ll make you grow big and strong’. She left out the part about how they’ll make you more beautiful too! We all know eating a primarily plant-based diet helps to prevent cancer, reduces risk of heart disease, prevents obesity & diabetes as well as so much more. These reasons alone should put more broccoli on your plate. However, we are human and humans, like it or not, are vain. We all want to be beautiful and often physical appearance matters more to individuals than overall health. So as a nutritionist who wants everyone to be healthy, I am trying a different approach. I am not telling my fellow readers to eat kale because it will reduce their chances of getting cancer – boring! I am telling you to eat kale because it will improve your looks. Now I think I got you all running to your nearest produce market. Plant derived foods, especially when consumed raw, contain copious amounts of beautifying properties. Vegetables and fruits are packed full of antioxidants, which destroy free radicals, slowing the aging process. They contain enzymes that improve digestion and the absorption of nutrients. Vegetables are also the highest mineral-containing foods, which are essential for hair, skin and nail health. Also, raw fruits & vegetables promote aliesthetic taste change, which is a stronger feeling of satiation, making one feel fuller faster. Therefore, raw foods help prevent over-eating and promote weight loss. When eating for beauty, fruits and veggies, especially raw, are a must. 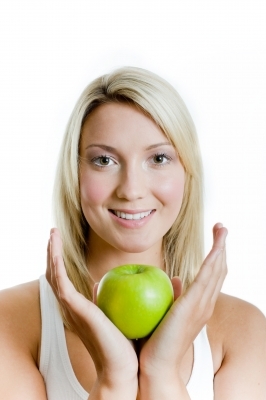 According to Eating for Beauty by David Wolfe, there are four ‘beauty minerals’. The ‘beauty minerals’ are vital for anyone trying to look their best. They are silicon, sulfur, zinc and iron. Silicon is the mineral probably most responsible for skin, nail and hair health. Strong and flexible joints, glowing skin and stronger bones are most often found on those who have sufficient levels of silicon in the body. Collagen, which helps to maintain the elasticity in the skin depends on silicon. Therefore silicon indirectly works at preventing wrinkles. Good food sources are: bamboo shoots, alfalfa, radishes, cucumbers and romaine lettuce. Sulfur has the ability to build and rebuild collagen, which we know greatly benefits hair, skin and nails. Sulfur also plays a vital role in the detoxification process due to its ability to neutralize toxins that are released from the cells, therefore helping to keep the body clean. This may explain why those with sufficient levels of sulfur in the body tend to have blemish-free skin and exude a radiant glow. Good food sources are: arugula, blue-green algae, cabbage, broccoli and garlic. Zinc helps to digest damaged collagen while rebuilding new collagen. This process helps to prevent wrinkling, stretch marks and premature aging. Zinc also plays a role in nourishing the sexual organs, which contributes to increased sexual energy and appeal. Good food sources are: sunflower seeds, pumpkin seeds, pecans, cashews and coconuts. Iron is the main component for hemoglobin synthesis. Iron-rich hemoglobin (blood) is responsible for carrying oxygen throughout the body, rejuvenating cells and promoting vitality throughout. Iron also generates a magnetic blood current in the nerve spirals. This magnetism is said to attract and add charisma to the individual. Good food sources are: Jerusalem artichoke, onions, cacao beans, cherries and most dark-leafy greens. According to a recent study done by the University of Nottingham, eating vegetables and fruits rich in carotenoids like carrots, blueberries, yellow peppers and tomatoes, created a healthy skin glow and participants were found to be more attractive than those who did not consume these foods. Not to say you cannot be attractive and eat meat. However, an increased consumption of plant-based foods in anyone’s diet is highly beneficial inside and out. If you are what you eat, then to look your best, you need to eat your best.